I probably don’t need to post a BYGL Alert! 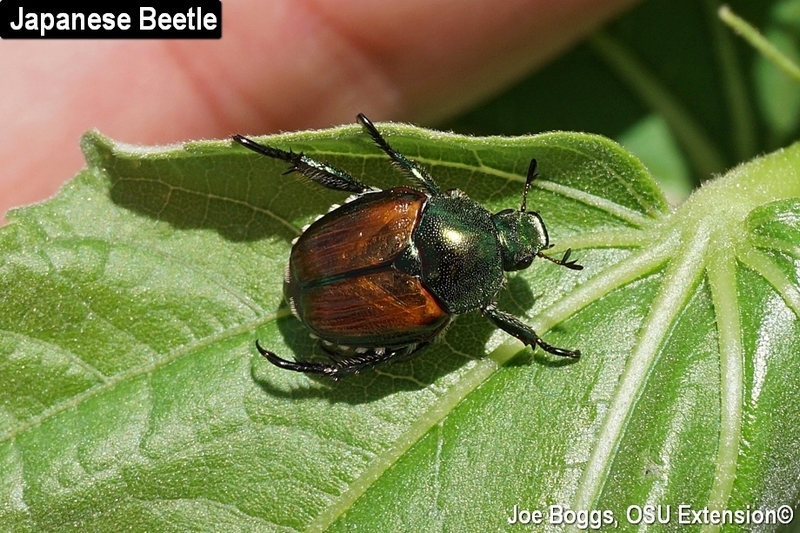 to make you aware that we are seeing large numbers of Japanese Beetles (Popillia japonica) in Ohio this season; you have no doubt seen them for yourselves. In fact, some of you have literally run into the beetles. I got a phone call today from my good friend, Denny Baker (Oasis Turf & Tree, Cincinnati, OH), who described driving through a “swarm” of around 20 – 30 beetles on I-74. He knew they were Japanese beetles because a few became plastered onto his windshield … a form of auto-control. We’ve had reports of very high Japanese beetle populations being seen throughout the state; it was a topic of discussion on today’s BYGL Zoom Inservice. However, the numbers appear to be highly localized. For example, Kim Kellogg (Grasshopper Group, Millersburg, OH) reported during the Inservice that he is seeing almost no beetles in their nursery while considerable numbers are being seen in landscapes only a few miles. This patchy pattern seems to be occurring throughout the state. Why are we seeing such high numbers? The short answer is we don’t know. The long answer is that despite being a non-native, Japanese beetles have started to behave like natives in some areas of North America with populations rising and falling naturally from year-to-year. Ever since Japanese beetles first arrived in North America in New Jersey around 1916, they have been gradually moving westward. Trailing behind the beetles are a whole host of natural enemies. Where the beetles have been living for a number of years, such as in Ohio, the natural enemies are able to act on this non-native pest just like natural enemies act on native pests. So, populations can rise and fall dramatically from year-to-year. I believe that’s what we’re seeing: a “natural” population cycle. How can I be sure? Because, we’ve seen it before.